Jessica is a hardworking, intelligent, and dedicated student as well as a mature and serious individual. 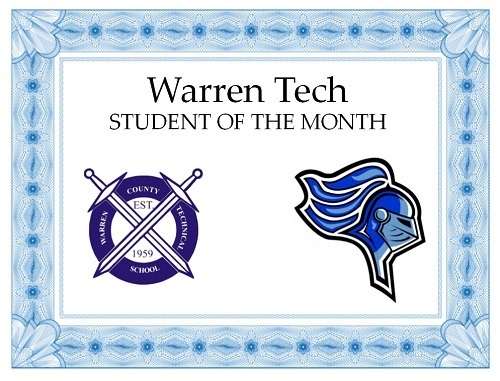 She sets the bar high for her academic success and continues to strive for excellence. Jessica is always respectful, courtesy, and kind to both her teachers and her peers. Adam is a junior in the Law & Public Safety program. He enjoys volunteering his time on the local first aid squad and fire department. Adam says he spends his free time volunteering simply because he enjoys helping others. Congratulations to Briana Villegas who is Warren Tech’s recipient of Rotary High School Student Recognition Award. Briana was nominated for the award by Health Science Instructor Maria Tamburro. Mrs. Tamburro noted that Briana has an advanced work ethic and high academic standing in her career area of Health Science. She serves as a Health Science mentor and tutors often. Mrs. Tamburro also highlighted Briana’s involvement in the community. Briana is very active in Girl Scouts Troop #900. She supported the veterans deployed by raising money, collecting food/clothing and making cards for the holiday seasons. She plans on doing her Gold Award in the area of raising mental health awareness and trying to de-stigmatize it. Additionally, Briana spent many hours helping Hackettstown Police Squad by donating money and clothes to be issued to members of the community who are in need. In 8th grade Briana was involved in setting up two assemblies at Hackettstown Middle School where they educated students about Bullying and Domestic Abuse. Principal Thomson was very fortunate to have Briana and her group collaborate with the Police Dept. and Hackettstown Life in order to organize this process along with qualified presenters. Briana volunteered at Common Sense for Animals and helped clean and provide a dignified bed and setting for those animals waiting for adoption. She also helped collect food to help support these efforts.Briana volunteered at a horse sanctuary in Belvidere with retired racehorses that are unwanted. She shows much compassion and love for animals while she cleaned, fed, transport, and love them.In September Briana joined Troop #135 of Health Explorers. She volunteers through St. Luke’s at Warren Hospital and provides helpful needs to patients on the floor such as talking to them or bringing them a warm blanket. This kindness and compassion is very much appreciated when patients are sick and away from home. This allows Briana to shadow the field she may want to go into in the future. After Warren Tech Briana plans on attending Rutgers University, where she is already earning college credits through her dual enrolled Health Science program. She plans on majoring in neuroscience.